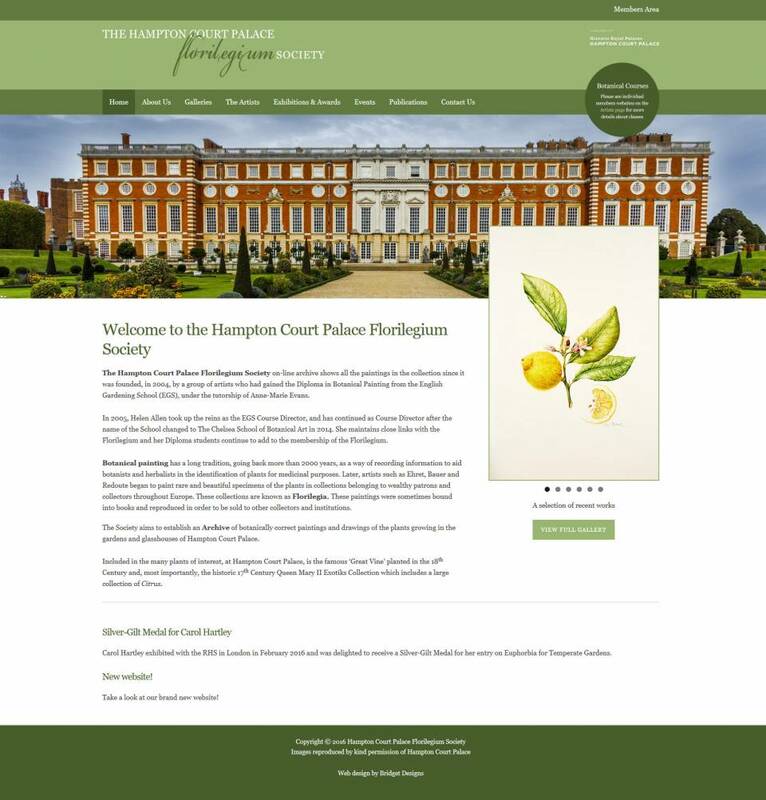 Hampton Court Palace Florilegium Society, was founded, in 2004. It aims to establish an archive of botanically correct paintings and drawings of the plants growing in the gardens and glasshouses of Hampton Court Palace. They came to Bridget Designs in need of a update and modernisation of their existing website which the previous developer was no longer able to maintain for them. The challenge was to clearly show the considerably number of beautiful drawings, going back many years, in a clear and organised manner that credited each artist. They also wanted a private members area where members could access useful information privately. The first task was to sort the images into year, artist and plant name groups, a huge task in itself. We then created galleries for each year, tagging each image in those galleries with the artist and plant name, so dynamic galleries based on this information could also be made. As a result it is possible to search by year, artist or plant type on the website, making it clear and effective to use. To give the artists full credit there is also an Artist’s bio section with links to their own websites, plus a members area and a detailed search function as well. The design is formal but modern, with a monochrome palette that allows the images to be the stars of the show. Bridget has transferred our elderly website to wordpress and has modernised and updated it with flair and attention to detail. We are very pleased with the result which speaks for itself. The design is exactly what we wanted and Bridget has added improvements that we did not think of ourselves. She also brings her design/artistic eye to the project and obviously takes great pride in achieving an excellent outcome. Bridget is pleasant and easy to work with, reliable, intelligent, proactive and good at her job. We can thoroughly recommend Bridget Designs for good designs, and meeting all the requirements of a job.